An eviction notice is a document issued by a landlord to his/her tenant in order to vacate the rental space for any reason. The reason of issue of eviction notice may vary from inappropriate behavior of the tenant, expiration of their rental contract, unpaid rent by the tenant etc. Irrespective of the reason, an eviction notice need to be issued to the tenant a few days before the eviction. If you are a landlord and planning to send an eviction notice to your tenant then you can make your task much easier by using Notice Forms. Check out the below listed options and download the suitable one. 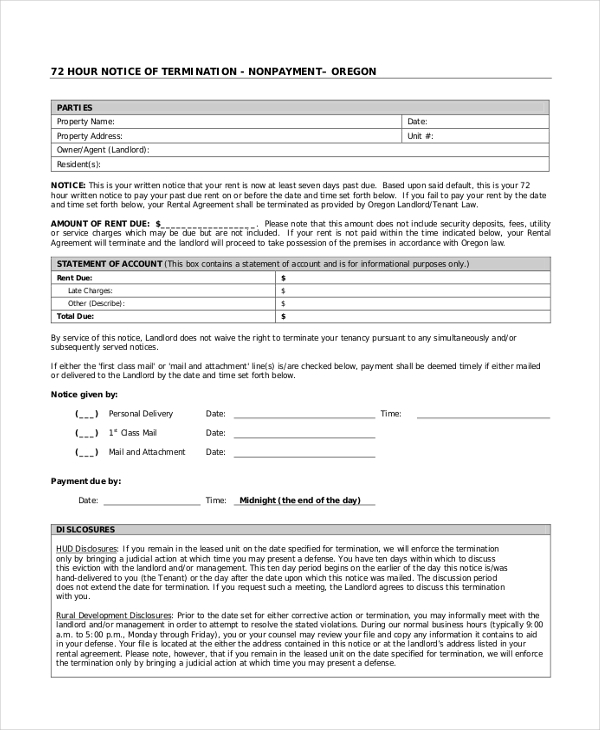 This 3-day eviction notice form is ideal for all landlords who are looking to issue eviction notice with a timeline of 3 days. It is available in PDF format and can be customized as per person needs. 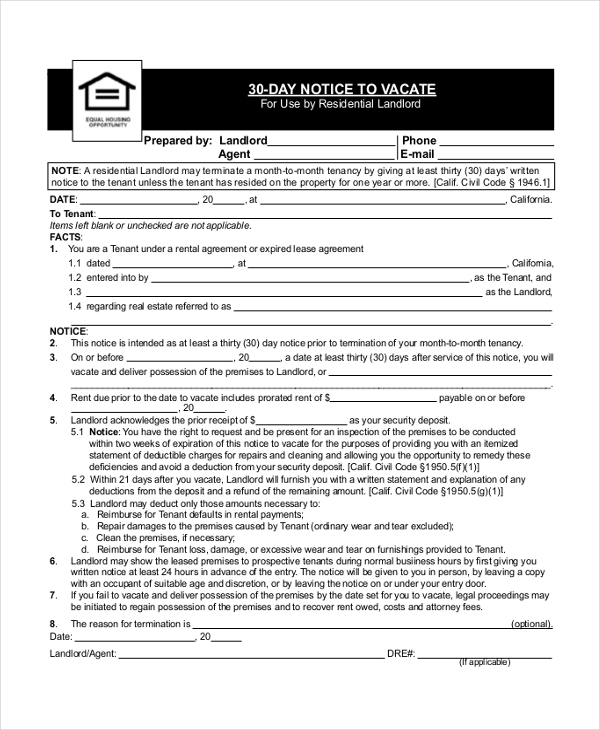 Check out this free eviction notice form and get downloaded the issues to your tenant to request evacuation of your space that you have given rent to them. Download now. Need your space to vacate within upcoming 30 days by your tenant? Here is the crucial notice form that would need to send to your tenant in order to get them notified about the evacuation timeline of your property. You can also see 30 Day Notice Forms. Looking for a suitable notice form to evacuate your property? Here is your required eviction notice form available in a printable format that you can download instantly and get customized as per your needs. 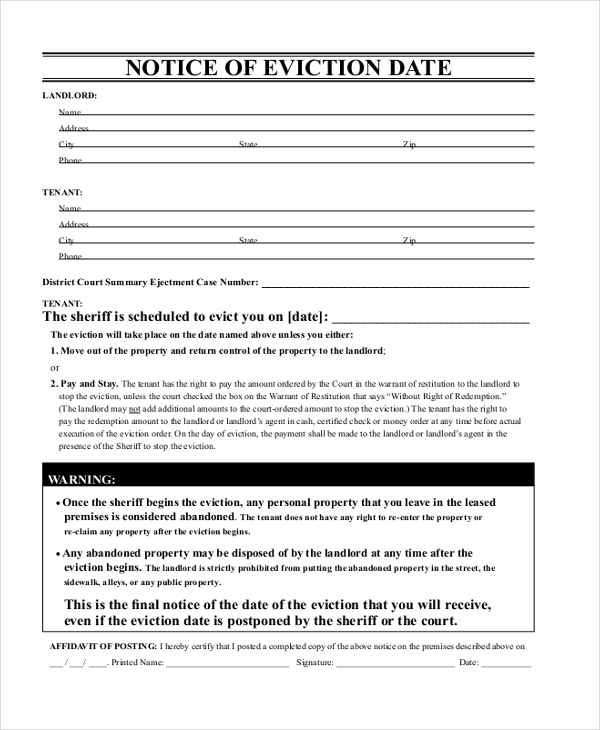 This is another sample eviction notice form available for instant download. 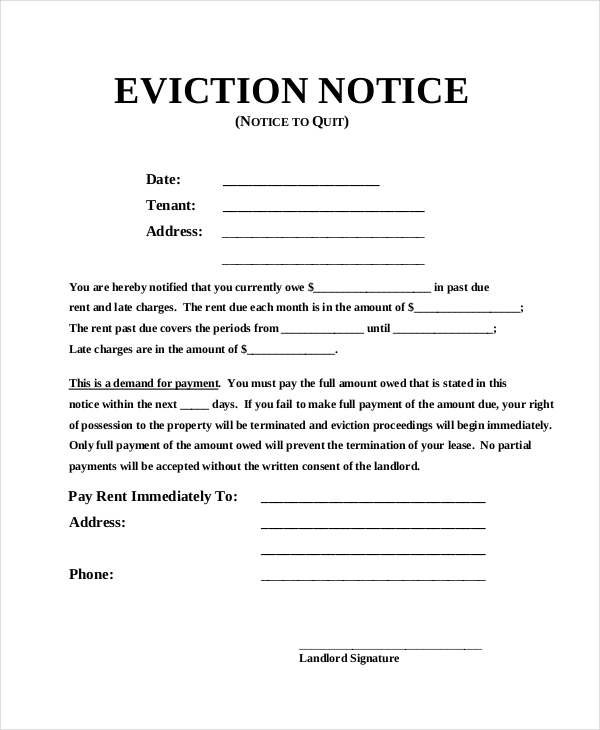 This eviction notice form can be used by all the landlords to issue a notice to their landlords for evacuating the property. 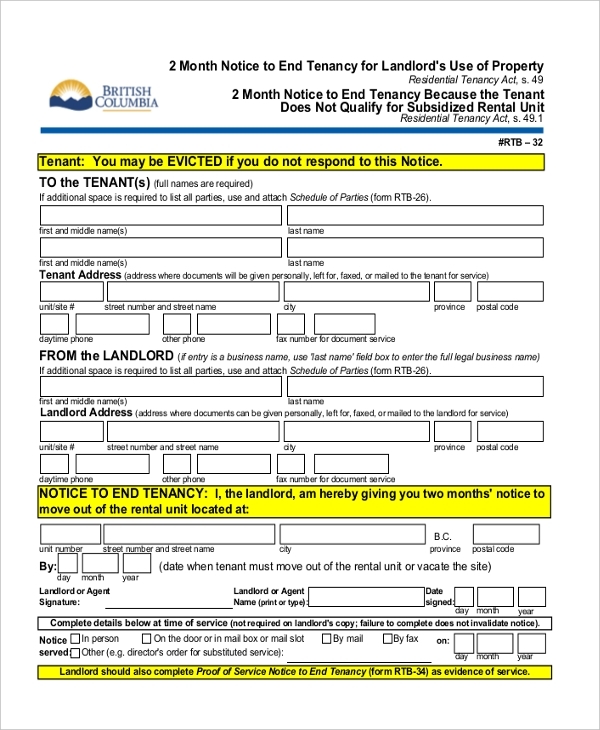 Try this tenant eviction notice form available online for download and issue a professionally created eviction notice to your tenant for vacating your rental property within the specified time period. If you are planning to issue a 2-month notice to end tenancy then this notice form is ideal for you to be utilized to issue a notice to your tenants specifying the time period within which they need to vacate the space. What are The Benefits of Eviction Notice Form? There are numerous benefits of eviction notice forms that a landlord may enjoy. Here are a few of those advantages. 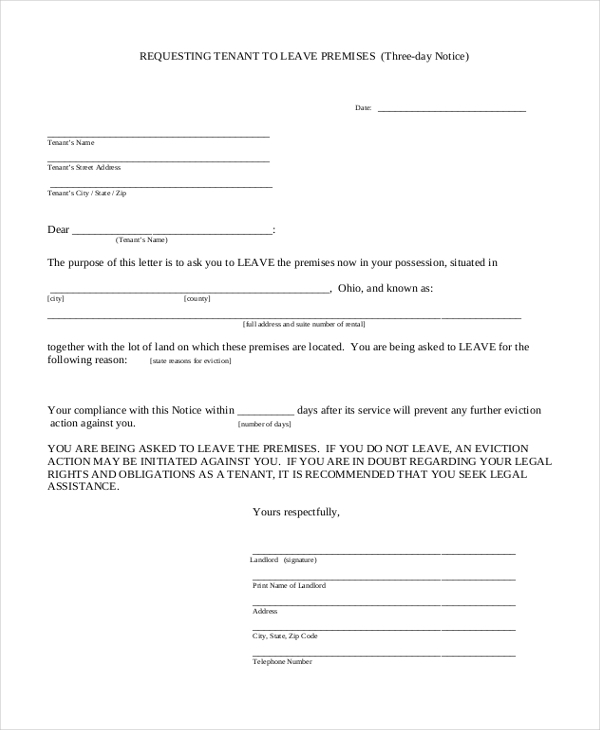 Eviction notice forms are recognized legal documents in the state of law and thus can be treated as proof of tenancy contract in court anytime whenever a dispute arises. For a landlord, these eviction forms give a peace of mind as otherwise vacating one’s rental property might be really stressful. An eviction notice form also ensures the safety of the tenant as he/she may get sufficient time to plan his/her shifting from the current place to another. You may also see Eviction Notice. When an Eviction Notice Form Need to Be Issued? An eviction notice form as the name suggest is issued when a landlord plans to end his/her tenancy contract with the tenant. The reasons of evacuation may vary condition to condition. But whatever reason a landlord has to evacuate his/her space an eviction notice is crucial to be issued. Eviction of a tenant cannot just be an informal and personal decision but the eviction needs to be completed following each and every legal regulation by the landlord as well as the tenant. And issuing an eviction notice form is one of the primary rules that every landlord need to be followed for a legal and lawful evacuation. 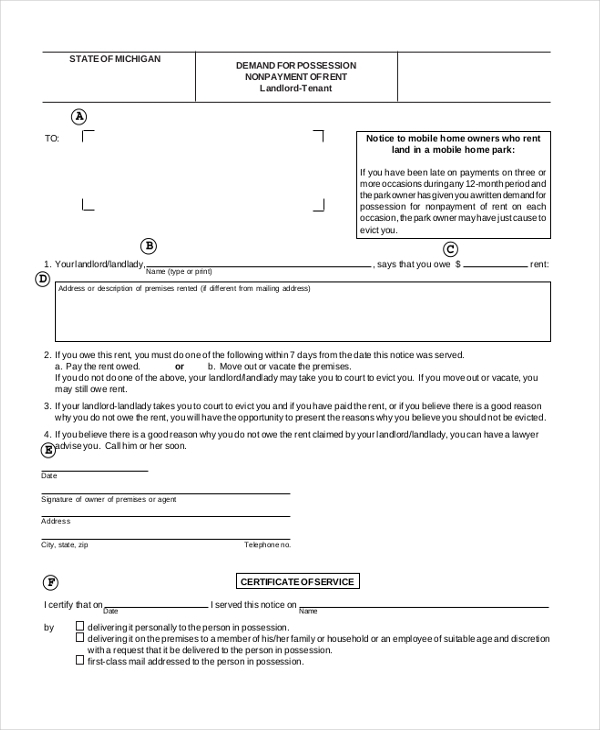 You can also see Notice to Vacate Forms. 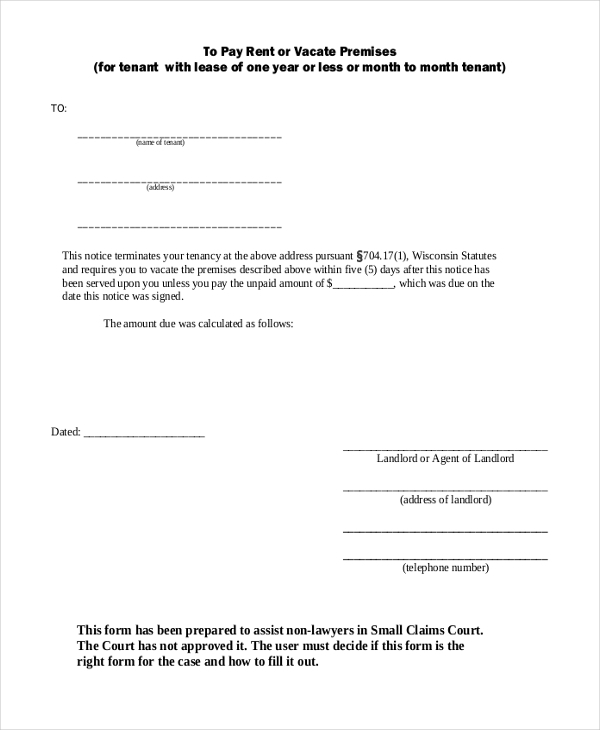 If you are also planning to end your tenancy contract with your landlord then these notice form would be the ideal solution for you to issue a notice to your tenant to vacate the rental space. You can find any of the 30 days notice, 3 days notice, 2 months notice and more forms and download as per your requirements.